I love bread, but we have to admit that they're becoming pricey now. Like for example, the Pandesal, back then you can have big pandesal for only a peso, now it costs around 2-3 pesos and you'll only get a half-of-your-palm size and it doesn't even taste yummy. So, when I was on a 'more than a month-long' vacation, I got to taste the bread from Arbee's Bakeshop. Theirs are yummy, sik-sik, and very affordable - which explains the long queue outside their bakeshop. See this bread? 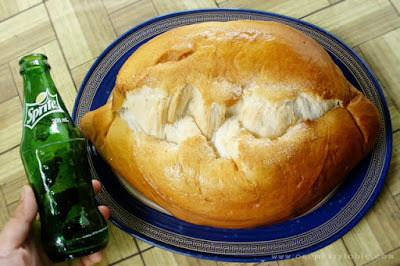 They call it Pan de Unan. Around 4-5 person can finish this off with a satisfied tummy. 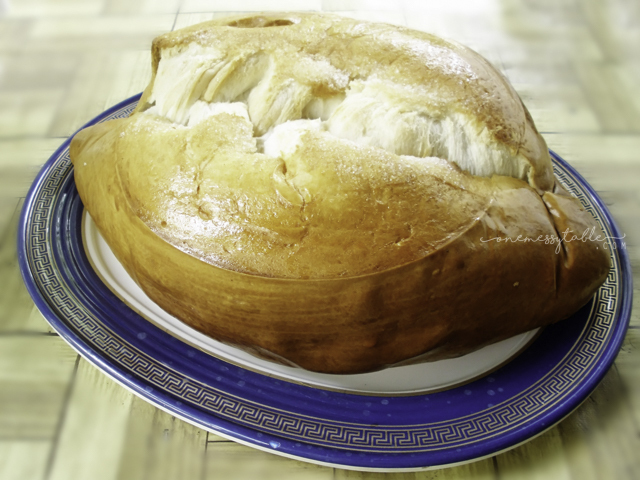 This bread is definitely worth it, even more than, would you believe that you can buy this for only Php 25.00? Yeah! I thought it was around 40-50 pesos! And aside from this huge bread, I got to taste their other bread too. Another favorite of mine is the Ham & Cheese. Oh, how I wish we have Arbee's here in the Metro too. Bigger than Sprite Sakto! Lol! Too bad, they're not open for any franchise yet. Hopefully, soon!